Email us today for our current discounted pricing! Managing the full potential of your forest is easy with the pulling strength of Wallenstein’s FX Skidding Winch. You can now reach the trees you need to cut, even on steep hills or swampland without the need for large heavy equipment. 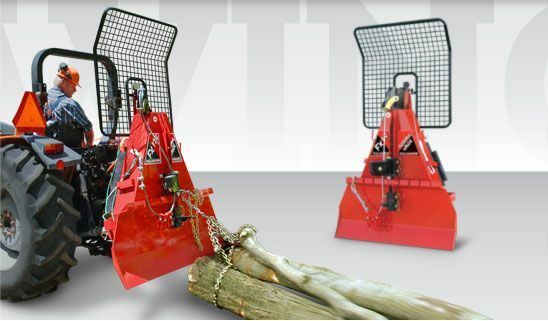 The FX Skidding Winch is the ideal tractor attachment for gathering firewood, clearing dead trees and harvesting premium lumber all while preserving your woodlot. With pulling power up to 12,000 lbs* and cable length of 165 feet, the FX Skidding Winch is designed for your woodlot. The entire winch system is easy-to-use with many features built for rugged durability and practical operation. Using a skidding winch is also easier on your tractor by transferring the pulling strain onto the ground with the large blade that anchors the winch. The Wallenstein FX Skidding Winch comes in three sizes to suit your tractor. Get more out of your woodlot with the Wallenstein FX Skidding Winch without the wear and tear on you, your woodlot or your tractor. View all 3 Wallenstein Skidding Winch models and information. Click here to download our full brochure. When you purchase any new Wallenstein product, we’ve got you covered with our 3 Year Consumer Warranty. Click here for more information on Wallenstein products.